We thought some of the findings are interesting so we translate and summarize it here. 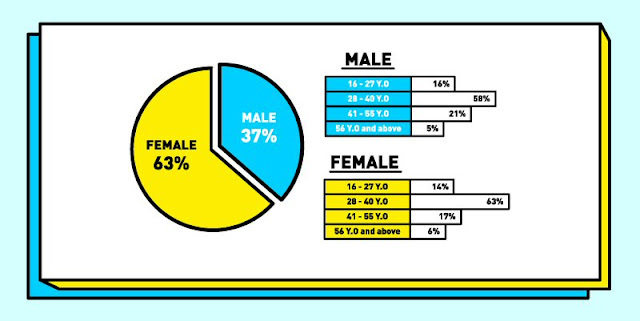 Before we start, below is the sampling demographics of the Nanyang's survey. Yes, you heard it right. 50% of the survey respondents feedback that there are rooms for improvement for online shopping sites / platform / marketplaces here. Only 12% of them are really satisfied, and the remaining 38% are in-between in terms of satisfaction level. Service level dissatisfaction is mainly due to lack of instant support and difficulties in arranging returns. 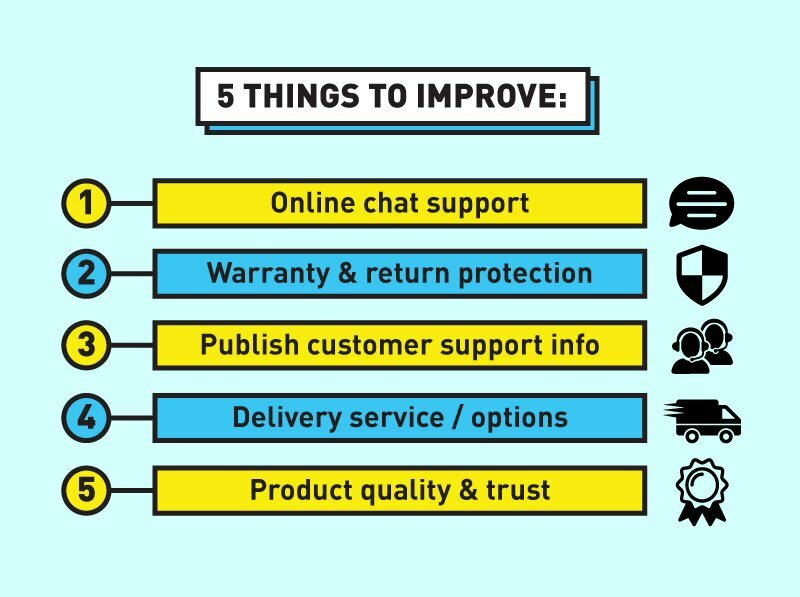 Respondents have feedback that online chat support is lacking, and sometimes it is even difficult for them to locate a phone number to contact. Consumers can only wait for at least 30 to 60 minutes on email support / reply if there is any issue. In the case of product defects, it is difficult to arrange exchange or return, and some would have just given up if it is a low-priced item. Besides that, consumers are also cautious on buying products online without a clear warranty protection. 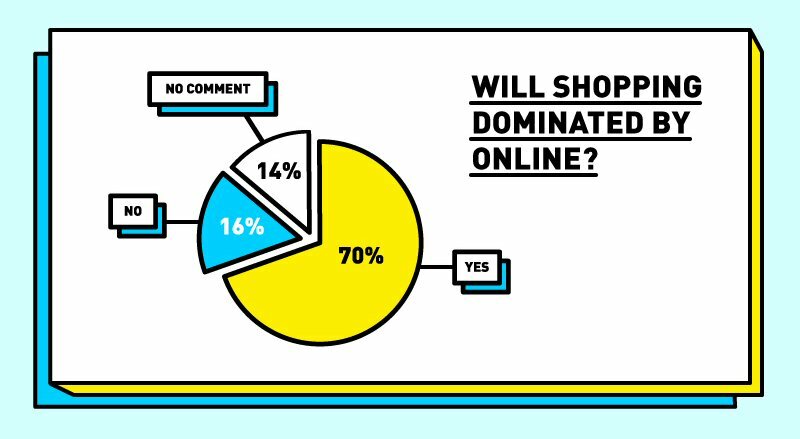 Even with challenges mentioned above, 70% of respondents are still optimistic on online shopping, until the extent that retail will be dominated by online. Only 16% think otherwise, and 14% without comment. Editor note: We are not sure how the question was being phrased to the survey respondent, but we think that online shopping wouldn't 'kill' offline retail, both will co-exist and compliment each other! Read also 10 retail shop we love and tips for e-commerce. Survey results have also shown that online shopping is more favored by Millennials, or to be precise those born after 1990. 37.5% of respondents between 16 to 27 years old shop online more than twice a month, mostly on items like consumer electronics and fashion. To be exact, 24% will not spend more than RM300 per online transaction to control excessive spending, while 26% will limit to only RM100 per transaction citing lack of trust on shopping sites, and to avoid being cheated. The remaining 50% do not have such cap on online transactions as long as the product is what they wanted and comes with good price. Some respondents have feedback that receiving online order is inconvenient when they are not at home, in which they suggest to emulate Taiwan where as collection at convenient stores is an option, where as consumers can collect the parcel after work. Editor note: While convenient stores might not be the best or the only solution here in Malaysia, parcel lockers like InPost and BOXiT might be an option for mass in the future. Read also 14 things you might not know about Taiwan. Nevertheless, there are also some respondents who have no issue of not being at home to receive the order. The solution? They get the courier personnel to drop the parcels at the security booth of condominium, or guarded community! 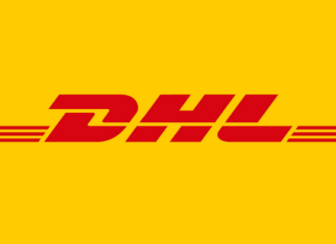 So far there is no parcel lost according to the respondents. It is the minority now for those who have never experienced shopping online. Out of this 22% group, 50% still prefer to shop offline due to lack of trust on e-commerce, while 33% did get some one else to help buying online, and the remaining 17% do not know how to shop online. 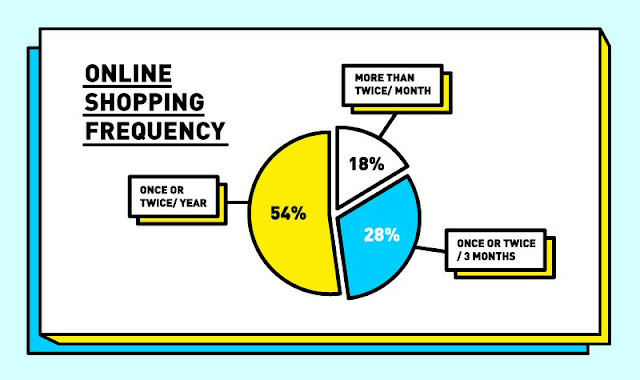 As for the 78% who have online shopping experience, 18% of them are frequent online shoppers (buy online more than 2 times monthly), 28% buy once or twice in 3 months, and the remaining big chunk of 54% are only buying online once or twice in a year! Compared to years earlier when ticketing (airline, hotel, travel etc) is the mainstream, local online shoppers are buying from wider range of categories ever since the emergence of e-commerce platforms. 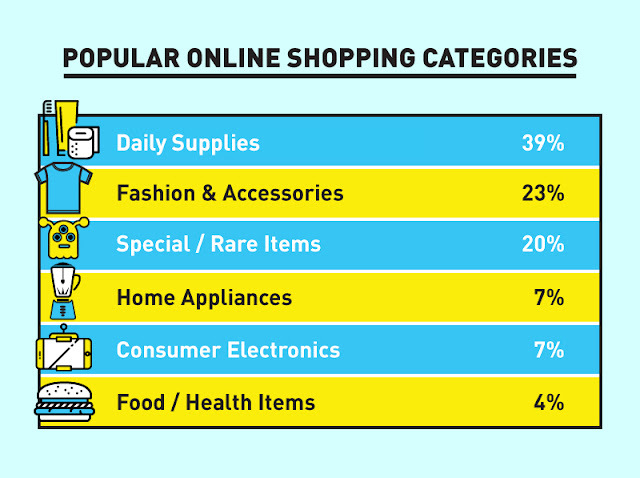 Daily supplies (health & beauty, fast moving consumer goods, grocery, kitchenware) top the respondents list with 39%, followed by fashion & accessories (23%), special or rare items (20%), home appliance (7%), consumer electronics (7%), and food or health items (4%). The main reason with daily supplies topping the list is, time-saving and convenience are the key motivations why consumers here prefer to shop online. It is not a secret that online always offer special and wide range of items which are not easily available from the offline retail. 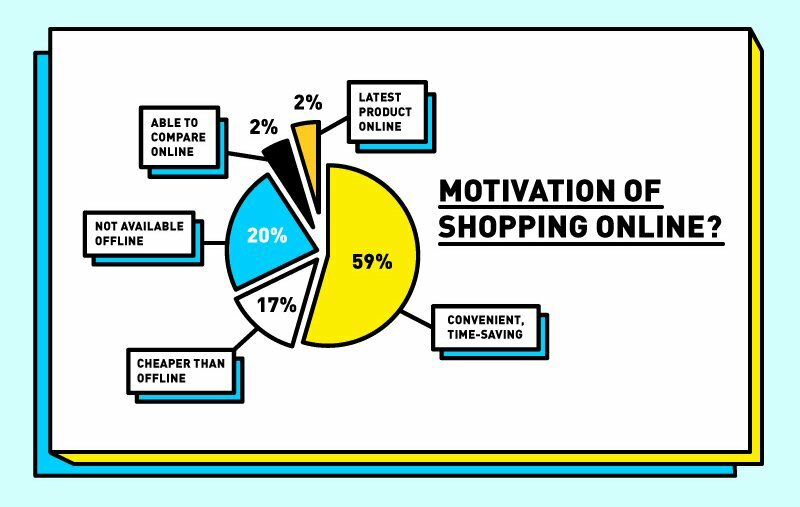 Only 17% of respondents feedback that they buy online because it is cheaper than offline, so it is not always true that online need to be cheaper than offline in this case. Does the actual product received match the online description? 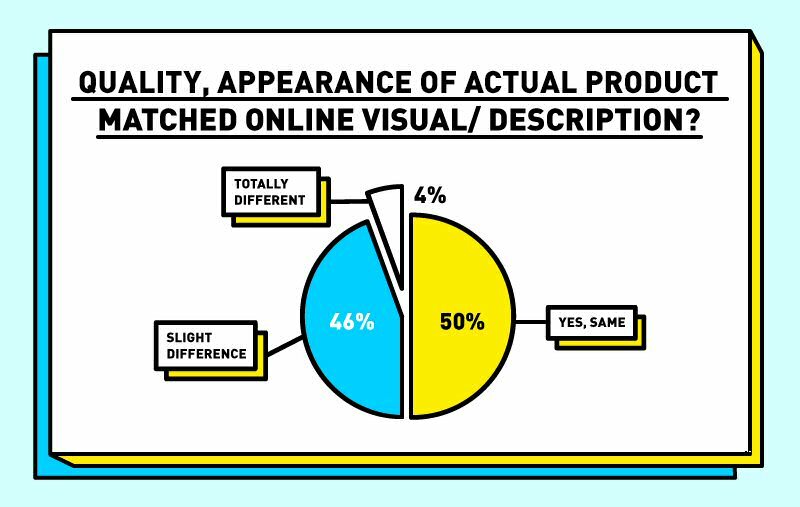 Yes, half of the respondents feedback that the quality, appearance of the actual product received matches the online visual, description presented. Only 4% have prior experience that it is totally different, while 46% think it is slightly different in which they usually experienced it with fashion items, followed by daily supplies. This is still acceptable by most respondents though, especially for lower-priced items. End of the day, it is about online merchants gaining trust from the consumers. Note: All visuals above are designed by Silver Mouse based on the data compiled and presented by Nanyang.